SIM-Drive Corp. (President: Professor Hiroshi Shimizu at Keio University), a university venture launched to drive technological progress in the electric vehicle (EV) market, announced on March 28, 2012, that it has started its third advanced vehicle development project with support from 26 companies operating in a range of industries, from automotive and housing to electric and air conditioning. The company aims to start mass-producing the new model around 2015. 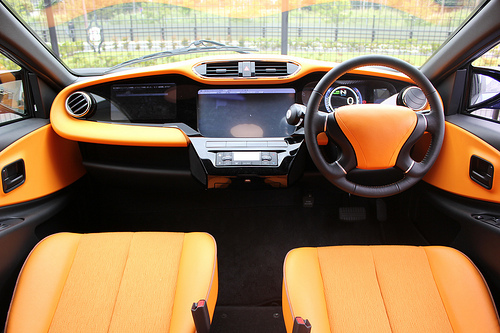 Using the technologies that allowed its second EV model to reach a range of 351 km on a single charge, SIM-Drive will develop a "smart transportation" concept for connecting EVs to smart homes, smart cities, and smart grids, and will develop the hardware and software to realize its concept, targeting March 2013 as its completion date. As with the development of its first and second models, the company is adopting an open source business model in which the vehicle and its specifications will be decided based on a consensus of the participating companies, with the design and prototype testing processes being carried out based on requests from and components provided by each company.